Do you want to hug this adorable little bear too? He could be YOURS! Meet the Saranac Bear (named after a region of rivers in NY). This little guy is beautifully hand-crafted by Ellen MacMaster of ‘EmBears. This bear is baby safe with embroidered eyes and nose and mouth. 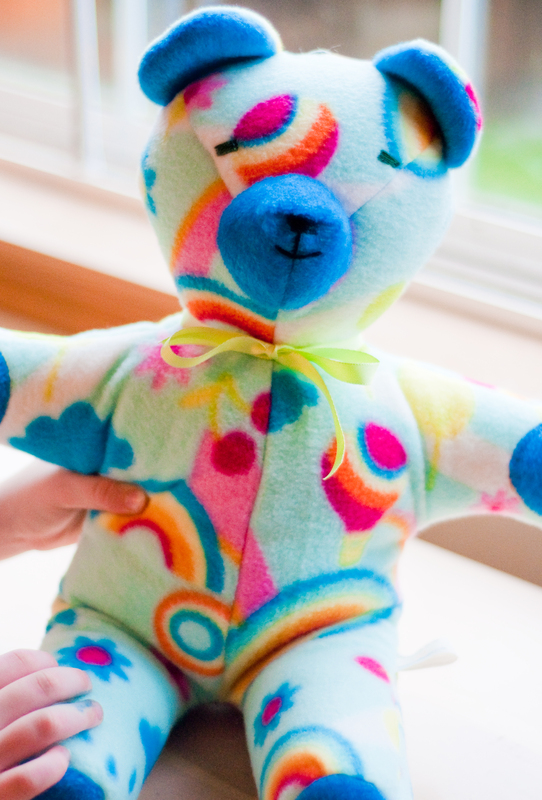 He is vibrant, super soft, made out of cotton-lined fleece, and is machine washable! When this bear arrived at my house, my children went crazy for him! My two older children immediately started asking if they could have him! My daughter wanted to cuddle him and my son wanted to take his nap with him. I know that the child in YOUR life will love him too! Kids will be drawn to the bright colors and huggably soft covering. Ellen has a whole line of adorable bears and “critters” for sale. 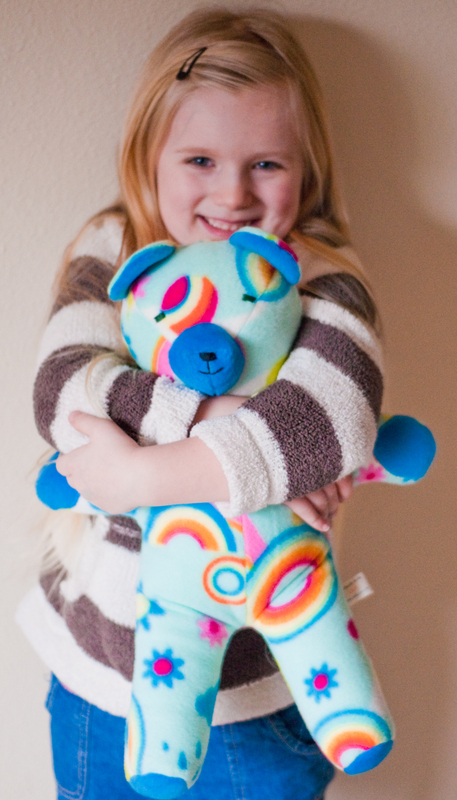 In addition to her fleece bears, she has a line of fully-jointed (and gorgeous!) bears, pandas, koalas,lambs, dogs, even a skunk and an opposum! One of my favorite products over at ‘EmBears is the memory bear. Ellen will take the shirt,robe, coat, etc. 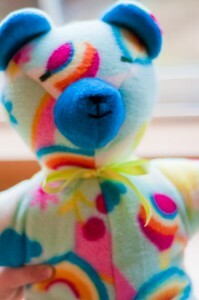 of a loved one, and create a “Memory Bear” with it. What a wonderful way to memorialize someone! I also think it would be a fantastic way to remember someone who is away at college, overseas, in the military, etc. I encourage all of you to check out her work at ‘EmBears, follow her on Facebook, and support this wonderful small business! If you are in the NY area, Ellen also offers teddy-bear workshops! The Panda Bear is my favorite.